A few months ago I read Steven Levine’s powerful book, A Year to Live: How to Live This Year as if It Were Your Last. The whole idea of the book is to act as if you only had one year left before you die and provides ideas on how to conduct your life so there are no loose ends — mentally, spiritually, physically, financially — before you leave the planet. The book gave me a lot to think about and also how to plan for the inevitable end of life, a topic too few people talk about. But because this is a new decade for me, and having outlived my father, my mother, older sister, and almost my older brother who died earlier this year, thoughts of how to live the last days, months, and years of my life have been on my mind. Another book that has been helpful is Susan Abel Lieberman’s book: Getting Old is a Full Time Job. Each chapter is about a different topic to tackle as you grow older, such as downsizing to a smaller home, dealing with financial matters, and putting all your important papers in order. I now have a three-ring binder called End Notes that contains important papers for my children, so that when I am gone, there will be no mysteries about the names of my banks, my checking and savings accounts, a list of what I want to give away to family members, etc. Rather than feeling morbid about this, I feel somewhat relieved, because everything I can think of is in that notebook. So as I clean, do laundry, pay bills, and pack, I ponder. If tomorrow is my last full day here, what is important enough to dwell on? My assets? Definitely not, especially since I have none to speak of. My ex-husband went bankrupt with our family business and we lost everything and I had to start over again at age 52. My jewelry? No. I have only a few good pieces I received from my (second) husband since we married a decade or so ago, and those few pieces are already on a list. Instead, what I am dwelling on are thoughts about a life that has been good to me, despite the divorce — a life filled with love of family and friends, good books to read, healthful foods to prepare, and cultivating an “attitude of gratitude.” I also dwell on something that I learned as a Jew, which is the idea of Tikkun Olam, translated as repair of the world. In my first marriage, my husband and I were emergency foster parents to 12 children. Doing this gave me a sense of doing a mitzvah, a good deed, although I think I benefited as much or more than I expected. I also volunteered at MANNA for a couple of years when I moved to Philadelphia, helping pack food for people with life-threatening diseases. Since I am a food nut, doing this gave me a good feeling of helping others eat well. Likewise, I was a volunteer for The Hunger Project in the late 1980s, presenting a four-hour program at schools on the topic of Ending Hunger. I learned that while hunger exists, it doesn’t need to, and each person can make a difference. So I now strive to make a positive difference in everything I do. Finally, being a mother who strived to raise children to be “good citizens,” which they are, has permitted me to see that motherhood is probably the least appreciated and most important job I have had amongst all my other paid jobs in my life. Actually, I have been paid, because my children have turned into wonderful adults that are making their own lives meaningful to themselves and those around them. Finally, December is a time when I receive solicitations from many worthwhile non-profit organizations. ( A list will appear on Dec. 1st.) My budget allows only small donations, but I give these small donations willingly, because I do believe we are our brothers’ (and sisters’) keepers. So as I pack my clothes, pay my bills, and prepare to fly to California, I feel a mixture of anxiety, gratitude, and peacefulness. Life has been good to me and I hope I have been good to others in my life. I have come full circle and trust that I have made a difference in the lives of people I have touched, and that if this is my last day on the planet, I have no regrets! Nancy Passmore has been publishing The Lunar Calendar for 42 years! 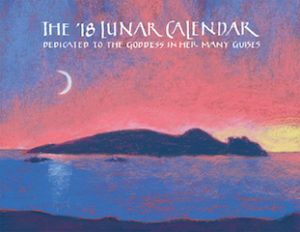 As the website (thelunapress.com) states, the calendar is dedicated to the goddess in her many guises. Please go to the website for ordering information and prices. A lunar calendar is a calendar based upon cycles of the Moon‘s phases (synodic months), in contrast to solar calendars whose annual cycles are based only directly upon the solar year. Instead of boxes with days of the week for each month, each calendar page is an oval with moon phases and numbers. It is an interesting way to view a calendar, especially if you are tracking your menses or missing your menses for pregnancy, peri-menopause or menopause. As I was unable to obtain some of the poems inside the calendar, I am posting one from my classmate, Mary Lou Meyers, my virtual poetess-in-residence. (Her full name is Marie-Louise Meyers.) She just happened to send this when I needed it! to light up on Earth, a Milky Way. in its passageway of desire. for it has white magic to bring. the tree, the humble dwelling magnified in sight. and the land of enchantment gone! where all will be explained. but must be honed from the light it disowns. i have never before owned. You are currently browsing the Menupause weblog archives for November, 2017.